It`s eastern and I`m stuck in the middle of the north sea, 40 knots wind and oilmud to my neck. Heck, I will soon be back shore and hopefully the roads allow some motorcycling then. Said it before, its time to lay down your shifter and allow some sun into your workshop. It`s spring time. Happy eastern to all who might read this. Female Harley rider from Oslo. 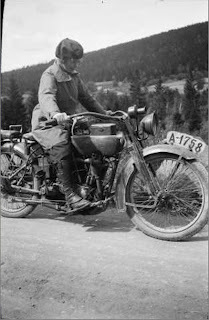 I like those old photos showing female riders from way back then.